Tonga ( /ˈtɒŋ(ɡ)ə/; Tongan: [ˈtoŋa]  Puleʻanga Fakatuʻi ʻo Tonga), officially the Kingdom of Tonga, is a Polynesian country and archipelago comprising 169 islands, of which 36 are inhabited. The total surface area is about 750 square kilometres (290 sq mi) scattered over 700,000 square kilometres (270,000 sq mi) of the southern Pacific Ocean. 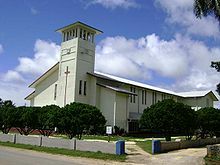 The sovereign state has a population of 100,651 people,  of whom 70% reside on the main island of Tongatapu. Tonga stretches across approximately 800 kilometres (500 mi) in a north-south line. 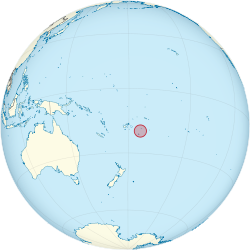 It is surrounded by Fiji and Wallis and Futuna ( France) to the northwest, Samoa to the northeast, Niue to the east (which is the nearest foreign territory), Kermadec (part of New Zealand) to the southwest, and New Caledonia (France) and Vanuatu to the farther west. It is about 1,800 kilometres (1,100 mi) from New Zealand's North Island. From 1900 to 1970, Tonga had British protected state status, with the United Kingdom looking after its foreign affairs under a Treaty of Friendship. The country never relinquished its sovereignty to any foreign power. 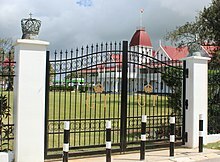 In 2010, Tonga took a decisive path towards becoming a constitutional monarchy rather than a traditional absolute kingdom, after legislative reforms passed a course for the first partial representative elections. An Austronesian-speaking group linked to the archaeological construct known as the Lapita cultural complex reached and inhabited Tonga around 1500–1000 BC. Scholars have much debated the exact dates of the initial settlement of Tonga, but Thorium dating confirms that the first settlers came to the oldest town, Nukuleka, by 888 BC, ± 8 years. Not much is known before European contact because of the lack of a writing system, but oral history has survived and been recorded after the arrival of the Europeans. Following the precedents of Queen Sālote and the counsel of numerous international advisors,[ who?] the government of Tonga under King Tāufaʻāhau Tupou IV (reigned 1965–2006) monetised the economy, internationalised the medical and education system, and enabled access by commoners to increasing forms of material wealth (houses, cars, and other commodities), education, and overseas travel. Tongans have universal access to a national health care system. The Constitution of Tonga protects land ownership: land cannot be sold to foreigners (although it may be leased ). While there is a land shortage on the urbanised main island of Tongatapu (where 70% of the population resides), there is farmland available in the outlying islands. The majority of the population engages in some form of subsistence production of food, with approximately half producing almost all of their basic food needs through farming, sea harvesting, and animal husbandry. Women and men have equal access to education and health care and are fairly equal in employment, but women are discriminated against in land holding, electoral politics, and government ministries[ citation needed]. In mid-2003, the government passed a radical constitutional amendment to "Tonganize" the press, by licensing and limiting freedom of the press, so as to protect the image of the monarchy. The amendment was defended by the government and by royalists on the basis of traditional cultural values. Licensure criteria include 80% ownership by Tongans living in the country. As of February 2004 [update], those papers denied licenses under the new act included the Taimi ʻo Tonga (Tongan Times), the Keleʻa, and the Matangi Tonga—while those permitted licenses were uniformly church-based or pro-government. On 15 March 2012, King George Tupou V contracted pneumonia and was brought to Queen Mary Hospital in Hong Kong. He was later diagnosed with leukaemia. His health deteriorated significantly shortly thereafter, and he died at 3:15 pm on 18 March 2012. He was succeeded by his brother Tupou VI, who was crowned  on 4 July 2015. The Tongan government supported the American " coalition of the willing" action in Iraq and deployed 40+ soldiers (as part of an American force) in late 2004. The contingent returned home on 17 December 2004. In 2007 a second contingent went to Iraq, and two more were sent during 2008 as part of continued support for the coalition. 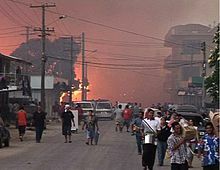 Tongan involvement concluded at the end of 2008 with no reported loss of life. Located in Oceania, Tonga is an archipelago in the South Pacific Ocean, directly south of Samoa and about two-thirds of the way from Hawaii to New Zealand. Its 169 islands, 36 of them inhabited,  are divided into three main groups – Vava'u, Ha'apai, and Tongatapu – and cover an 800-kilometre (500-mile)-long north-south line. The climate is tropical with a distinct warm period (December–April), during which the temperatures rise above 32 °C (89.6 °F), and a cooler period (May–November), with temperatures rarely rising above 27 °C (80.6 °F). The temperature increases from 23 to 27 °C (73.4 to 80.6 °F), and the annual rainfall is from 1,700 to 2,970 millimetres (66.9 to 116.9 inches) as one moves from Tongatapu in the south to the more northerly islands closer to the Equator. The average wettest period is around March with on average 263 mm (10.4 in). The average daily humidity is 80%. The highest temperature recorded in Tonga was 35 °C (95 °F) on 11 February 1979 in Vava'u. 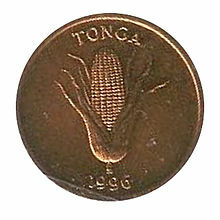 The coldest temperature recorded in Tonga was 8.7 °C (47.7 °F) on 8 September 1994 in Fua'amotu. Temperatures of 15 °C (59 °F) or lower are usually measured in the dry season and are more frequent in southern Tonga than in the north of the island. The tropical cyclone season currently runs from 1 November to 30 April, though tropical cyclones can form and affect Tonga outside of the season. Tongans enjoy a relatively high level of education, with a 98.9% literacy rate,  and higher education up to and including medical and graduate degrees (pursued mostly overseas). Humans have lived in Tonga for nearly 3,000 years, since settlement in late Lapita times. Before the arrival of European explorers in the late 17th and early 18th centuries, Tongans had frequent contacts with their nearest oceanic neighbours, Fiji and Niue. 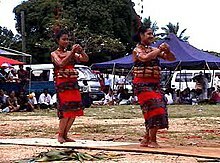 In the 19th century, with the arrival of Western traders and missionaries, Tongan culture changed, especially in religion. As of 2013 [update], almost 98 percent of residents profess Christianity. The people discarded some old beliefs and habits and adopted others. Contemporary Tongans often have strong ties to overseas lands. 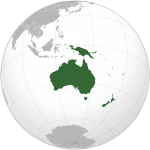 Many Tongans have emigrated to Australia, New Zealand, or the United States to seek employment and a higher standard of living. The United States is the preferred destination for Tongan emigrants, and as of 2000 there were 36,840 Tongans living in the US. More than 8,000 Tongans live in Australia. The Tongan diaspora retains close ties to relatives at home,[ citation needed] and a significant portion of Tonga's income derives from remittances[ citation needed] to family members (often aged) who prefer to remain in Tonga. Rugby union is the national sport,  and the national team (ʻIkale Tahi, or Sea Eagles) has performed quite well on the international stage. Tonga has competed in six Rugby World Cups since 1987. The 2007 and 2011 Rugby World Cups were Tonga's most successful to date, both winning two out of four matches and in a running chance for the quarter finals. In the 2007 Rugby World Cup, Tonga won its first two matches, against the USA 25–15, and Samoa 19–15. They came very close to upsetting the eventual winners of the 2007 tournament, the South African Springboks, losing 30–25. A loss to England, 36–20 in their last pool game ended their hopes of making the knockout stages. Nevertheless, by picking up third place in their pool games behind South Africa and England, Tonga earned automatic qualification for the 2011 Rugby World Cup in New Zealand. In Pool A of the 2011 Rugby World Cup, Tonga beat both Japan 31–18 and 5th ranked  eventual finalist France 19–14 in the latter pool stages. However, a previous heavy defeat to the All Blacks at the tournament's opener (41–10) and a subsequent tight loss to Canada (25–20) meant that Tonga lost out to France (who also lost to NZ) for the quarter finals due to 2 bonus points and a points difference of 46. ^ Burley, David (2012). "High precision U/Th dating of first Polynesian settlement". PLoS One. 7 (11). doi: 10.1371/journal.pone.0048769. ^ " The Sun Finally Sets on Our Men in Paradise"; The Daily Telegraph; article of 21 March 2005; retrieved August 2016. ^ "Tonga's diplomatic community grows"[ permanent dead link], Matangi Tonga, 12 January 2009. ^ Small, Cathy A. and Dixon, David L. " Tonga: Migration and the Homeland", Migration Policy Institute.